Weird as this sounds I much prefer decorating small spaces to massive spaces. Give me a massive space and I’ll create you lots of different vignettes that will cosy it up whereas with a small space my job is half down – less work for me makes me an extremely happy girl! Add a mirror, preferably an oversized one as it will make your small space appear grander than it really is. Not only that it expands horizons and adds depth as I continually bang on about. Mirrors and small spaces are a marriage made in heaven! When it comes to the big-ticket items, chairs, sofas, tables I tend to keep these in proportion to the rooms size. So in a small room I would put a loveseat and some occasional chairs as opposed to a super large sofa. Upholstery pieces take up the most room and set the vibe; if all you have is some large sectional skimming the walls the space will feel very flat! Same goes for a dining table, I would probably go for round – it will break up all the rectangular lines. Same also goes for a coffee table; I wouldn’t go for a large one that took up most of the room, as it will draw the eye to the fact that the space is tiny. Go instead for assorted surfaces I’m thinking Moroccan pouf, little side table, drinks trolley that sort of thing. Add patterns, as in throws, rugs, cushions, wallpaper. Patterns add instant pizazz and distract the eye from the space. 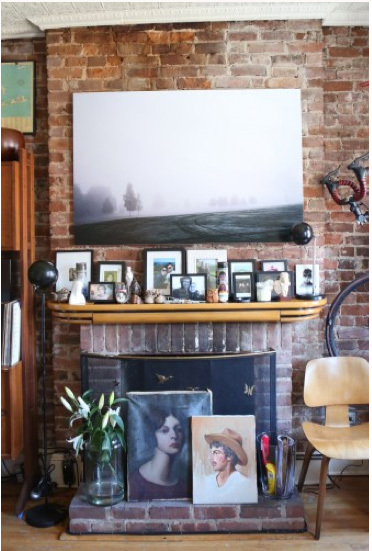 Talking of distracting the eye – add stuff to your walls the more you can tantalise the eye the more you take the focus away from the smallness, instead you shift the emphasis onto the coolness! With small spaces you just need to be a little more canny, strategic and have the ability to think outside the box and not be put off because off the restrictions! There is nowhere better to be than home – be that a 350 square foot box or 3000 one. Its what you do with it that countsÂ – right! I came across this apartment, teeny tiny on Takes of Endearment and whilst its not so much my style I love that is been decorated with attitude. We decorate for ourselves and if it makes us happy then who gives two hoots what anyone else thinks. 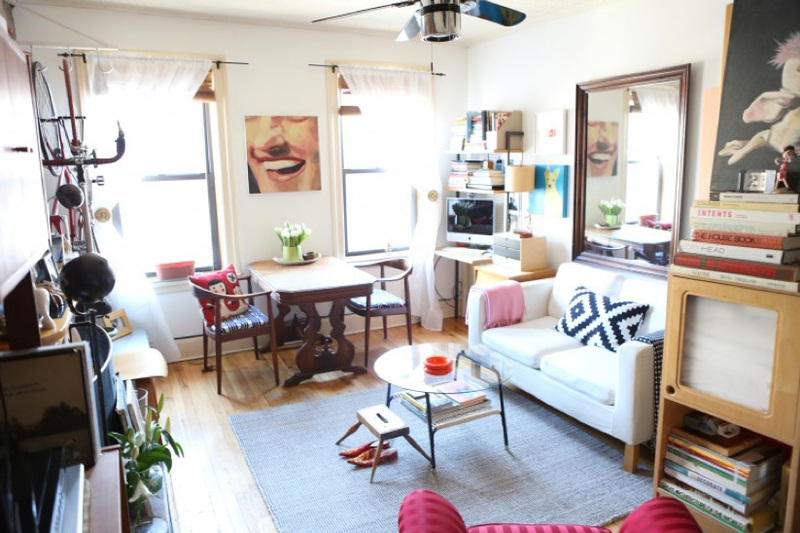 Check out how one small room is super multi functional – dining, relaxing working all in one!